After a while, one begins to feel that there is absolutely nothing accidental or incidental in the writings of W.G. Sebald, that there are no insignificant references or things mentioned merely in passing. One of the great joys of reading Sebald is to follow one of the countless references in his books to see where it leads. A few pages into The Rings of Saturn, as the narrator lies in the hospital “in a state of almost total immobility,” he is reminded somewhat morbidly of the sudden deaths of two friends who were younger and who, like himself, were scholars of literature. The narrator notes briefly that one of the two – Michael Parkinson – was in the midst of writing a study of Charles Ramuz, a name that was completely unknown to me. The current Wikipedia entry on the French-speaking, Swiss-born writer Charles Ferdinand Ramuz runs only ten sentences, but is followed by a list of twenty-nine books that he wrote between 1903 and 1944. Ramuz also wrote the libretto for Stravinsky’s Histoire du Soldat and his portrait appears on the current Swiss 200 franc note. A couple of months ago I decided to find one of his books and discover Ramuz for myself. 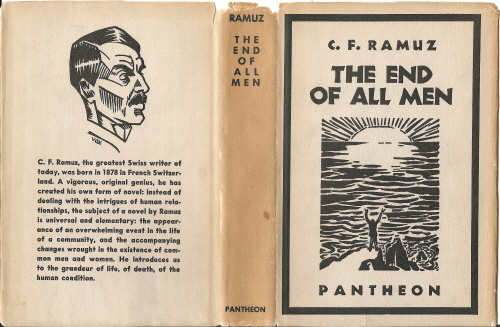 Drawn to the apocalyptic title and the woodcuts on the front and back cover (by an artist identified only as Vox), I choose The End of All Men, a 1944 translation of his 1922 book Présence de la mort.As I read the Introduction by Denis de Rougemont, I began to sense clear relationships between Ramuz and Sebald. Ramuz does not write novels in the ordinary sense of the word; he writes prose poems, epic descriptions. His books have no plots, or at least the plots are reduced to the most elementary simplicity. I know of no other writer who has been able, like Ramuz, to translate the incarnation of the catastrophe into the concrete details of everyday life. I know of no other writer who has been able to ask the great metaphysical questions in terms of objects, elementary sensations, little everyday phrases. It is almost as if, by mentioning Ramuz in The Rings of Saturn, Sebald was very slyly creating his own literary genealogy by quietly indicating possible predecessors. The End of All Men describes the imminent end of the earth as it plunges toward the sun “through an accident to the law of gravity.” Nature is the main character, with mostly anonymous humans acting in bit parts and scarcely more important than ants on an anthill. As the apocalypse approaches, our civilization is put into perspective and is mostly found wanting. In the final chapter, the unnamed narrator and others leave the Swiss valley where much of the novel takes place and begin to climb. We climbed up under the weight of our knapsacks, we had our canteens, we took off our coats and collars, and rolled up our sleeves. The beginning consisted of a frightful stony embankment open to the sun. At the foot of this embankment there had been built (not long since) a large factory where they made carburetted hydrogen. We began to climb the length of the enormous cast-iron, black-painted pipe which drove the turbines, larger than ten of us and as round as you are high, which went right down even as we were going right up, – and, from afar, could be seen the line it made without understanding what it was, because in nature there was nothing like it. We climbed straight up and straight ahead. The small gravel, the grit, these flat pebbles never balanced, were very discouraging underfoot. Swarms of flies flew slap into your face, and there were those large bumblebees, which are incapable of changing direction, and hit you in the temple as when children shoot their elder-pith balls at you. The lizards were completely motionless, then changing utterly, rapid as thoughts. We climbed. For another eight or nine pages they continue to climb up through poor alpine farm villages and thick, primal woods until they reach a promontory where the book ends as the small group seemingly becomes one with the universe.The End of All Men has a quirky, almost biblical style, and a shape-shifting narrator. In one moment the narrator can be omniscient, reporting on events from a global perspective, while at other times he’s just another villager. Michael Parkinson wrote The Rural Novel: Jeremias Gotthelf, Thomas Hardy, C.F. Ramuz (1984).